When I was young I wasn’t a great reader of books, comics yes and it was only when into my mid-teens did I start devouring literature. Books by Jean Paul Sarte and the like, I chose anything that added a wee bit of intellectual or even Parisian ‘left bank’ sparkle to my life. But even to this day I have never read a Charles Dickens book from cover to cover. Of course I think I know all the stories and I have seen some great black and white films, especially those by director David Lean and his post World War Two contemporaries. My early view of a Dickens’ book was of odd characters living in a dark twilight world inhabited by madness, greed, work houses and melodrama (though I did sometimes confuse Dickens with Sherlock Holmes). One of the biggest pieces in my Dickens template was the brilliant film musical ‘Oliver’ by Lionel Bart made in 1968. Bright in colour, action and great songs (‘got to pick a pocket or two…) and the depiction of the deaths of Nancy and Bill in this film was set firm in my conciseness. Now I know that the film ‘Oliver’ softened the realism of Dickens for instance setting the brutal death of Nancy on the steps of old London Bridge (not the present bridge, rather the one now in Arizona) whereas Nancy’s ‘martyrdom’ was actually set in her bed at the dead of night, which I guess was a little too salacious for a family film. Nancy puts up with Bill Sikes violent nature because she loves him, but even that love is not enough to prevent her from doing the ‘right thing’ by the orphan Oliver Twist. At the time quite a few Victorian moralists criticised Dickens for portraying the main act of heroism in the book to a women with an ‘unsavoury’ lifestyle. Dickens was also taken to task for the melodrama of the death, but many also saw the similarities with a real case of murder that some referred to when talking about the early ‘Jack the Ripper’ murders, saying that they were ‘Grimwood like’. The shocking nature of Dickens description of the coldblooded nature of the slaying of Nancy shocked his readership with its brutality, but it echoed real life. The atmosphere and setting follows strongly the description of the murder of Eliza Grimwood in 1838 in Waterloo and which was a massive news story. Both Eliza and Nancy were brutalised and killed with excessive violence. In fact Eliza had her throat cut rather than being bludgeoned to death. The hunger for grisly murder stories was great in Victorian London, and there was a rumour at the time that hired killers would sometimes perpetrate gruesome crimes when news was slow. Oliver Twist had begun serialisation in 1837 and Eliza’s death predates the chapters describing Nancy’s end which comes to a climax in the latter part of 1838. Some like to say that we live in times of lawlessness and fear never seen before, a symptom of modern loose morals etc. etc., but if you lived in Georgian or Victorian London you would bar your home even tighter, keeping a watch in your house and leave the night to the feral, robbers, the desperate, dispossessed and killers who laid siege to your person, household and goods. When Charles Dickens was given a tour of the most notorious ‘rookery’ at Jacobs Island (‘Rookery’ being a colloquial name for a slum which highlighted the way people lived akin to a rookery of birds where vast numbers perch in high trees), he was accompanied by a chief of police and armed officers, such was the danger. ‘God fearing’ folk stayed clear of these pockets of London for fear of disease and crime. The ‘Rookeries’ were slums lacking basic amenities, and they were filthy and diseased, and that at a time when England was building its empire and great wealth was being accumulated by some. Fellow writers and social commentators told a similar story and some even organised wagons to distribute water because the area lacked basic sanitation and a clean water supply. One of the few water sources available to the residents was actually removed and replaced by a polluting metal smelter, such was the lack of care by officials and others in authority. Alcoholism was endemic simply because it was safer to drink than water, and gin became a staple, being cheap. This was a place where cases of cholera etc. were too common. Life expectancy in the mid 1800’s was on average between 25 to 30 years and a child might, just might make it to five years old. Social reformer Henry Mayhew described Jacob’s Island as a “pest island” with “literally the smell of a graveyard”and “crazy and rotten bridges” crossing the tidal ditches, with drains from houses discharging directly into them, and the water harbouring masses of rotting weed, animal carcasses and dead fish.” He also wrote that the rivers and drains ran red with the pollutants from the tanning and lead smelting industries located there. Many people were born into poverty that they could never leave, but with few social safety nets available a fall from a relative comfortable life could come quickly; even ‘respectable citizens could be thrown into the mire and find themselves also in the rookeries. Later in the 19th century Charles Booth produced a ‘poverty map’ of London in 1889 which showed that poverty affected one third of Londoners, it was Booth who developed the idea of a ‘poverty line’ where families had to stay above to subsist. This map also showed that rookeries or slums were set often cheek by jowl with other classes of society. It was to Jacobs Island, the worst of all rookeries situated between two great drainage ditches that Bill Sikes escapes after his bloody deed and it is here, amongst the most wretched of the wretched and the poorest of the poor, that Sikes meets his end – after he is chased through raw sewage in the ‘Folly Ditch’ until his death aloft. One of the principle locations of Oliver Twist is Fagin’s lair of young pickpockets and thieves, and this too was located in another notorious rookery at Saffron Hill “near Field Lane” (Dickens), Clerkenwell and this was close to ‘Cold Bath Prison’. A surviving building from this period is the ‘One Tun Pub’ called the ‘Three Cripples Pub’ by Dickens in Oliver Twist. This area of degradation included ‘Seven Dials’ located in now fashionable Covent Garden. Dickens lived just over 10 minutes away in Holborn, but outside the rookery. 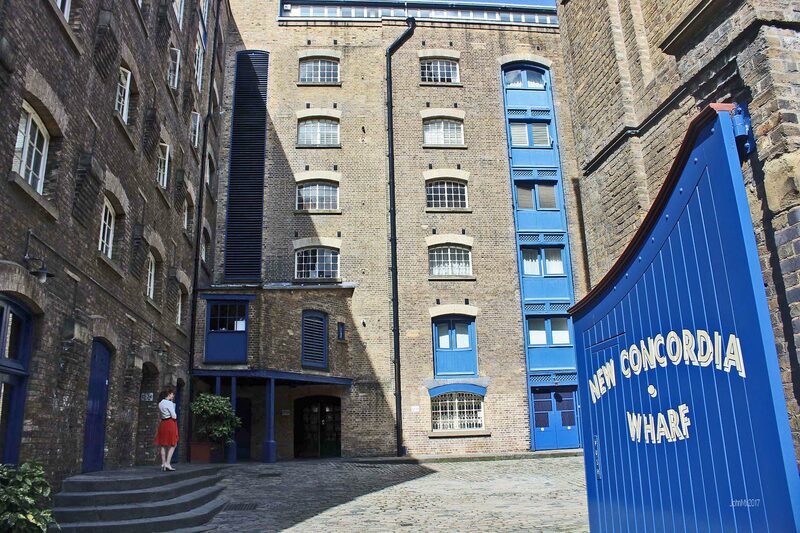 For huge numbers of Victorian Londoners life was lived on the visceral edge, and today at Jacobs Island only a warehouse survives from Dickens day at Jacobs Island. It has now been joined by high end apartments and other similar areas have seen much the same. The move to provide social housing by George Peabody in 1862 and by others was inspired by the call to do away with London’s slums or rookeries. When you walk the river today from Tower Bridge to Surrey Quays you can see how outside the old docks – the land strip adjacent to the river – many council or social housing has replaced the rookeries. In contrast, built upon the redundant docks are miles of almost boringly uniformed new builds that were bought up by the ‘well to do’ or as was said at the times, by ‘Yuppies’. But what is clear is that Dickens by setting his novels in real situations he highlighted how low the life chances were for ordinary people and despite great work by social reformers many of the undercurrents of Georgian and Victorian life remain to this day. Nancy’s death in the musical Oliver is a fiction within a fiction, but the fiction of Oliver Twist is inspired by fact.